Not "Goodbye" but "See you later"
On July 6th, 2009, my first day at Cabrini Connections, the first day of the 2009 Edgewood College Experience, I was greeted by three students: Savon Clark, Sean Mayfield, and Charles Hill. They welcomed me with open arms and we clicked right away. At that point, I had no idea how great of an experience working at Cabrini Connections would be and how much I would get to know these three young men and so many others over the course of 132 tutoring sessions, 19 Youth Leadership Council meetings, eight college visits, and more. 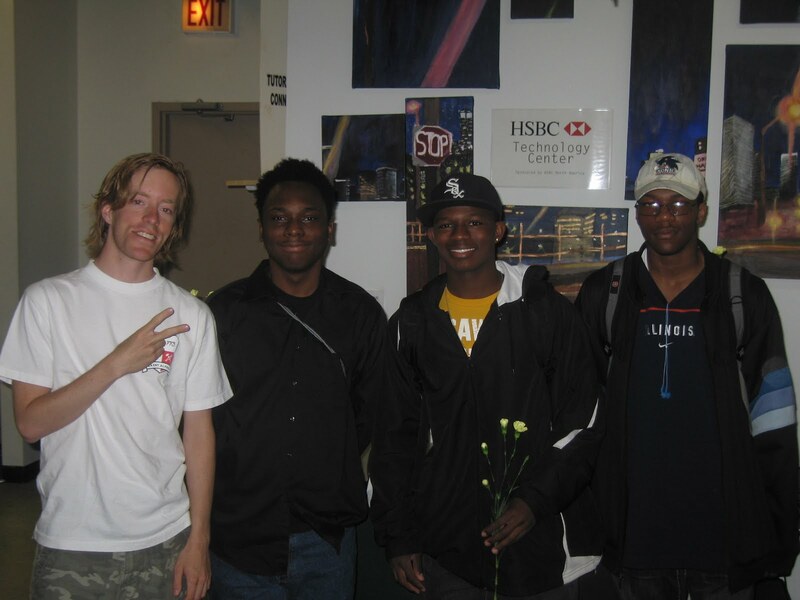 Two years later, here I am again with Savon, Sean, and Charles (above) at the 2011 Edgewood College Experience. They are juniors in high school now. Sadly, however, where they once welcomed me in, they are now seeing me off. 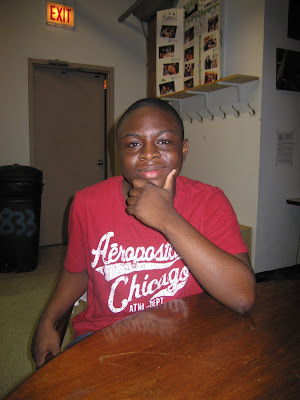 Yesterday, July 15th, 2011, was my last day at Cabrini Connections. I was laid off due to the organization's continued financial struggles. Over the last 20 pay periods dating back to September 2010, the staff has been paid in-full and on-time only six times. Next week's Golf Benefit could make or break the organization. While it has been a tough year and I am sad to see it end like this, I am proud of our accomplishments and I know I personally have learned a lot from everyone I worked with at Cabrini Connections - especially my "partner in crime" EL Da' Sheon Nix. 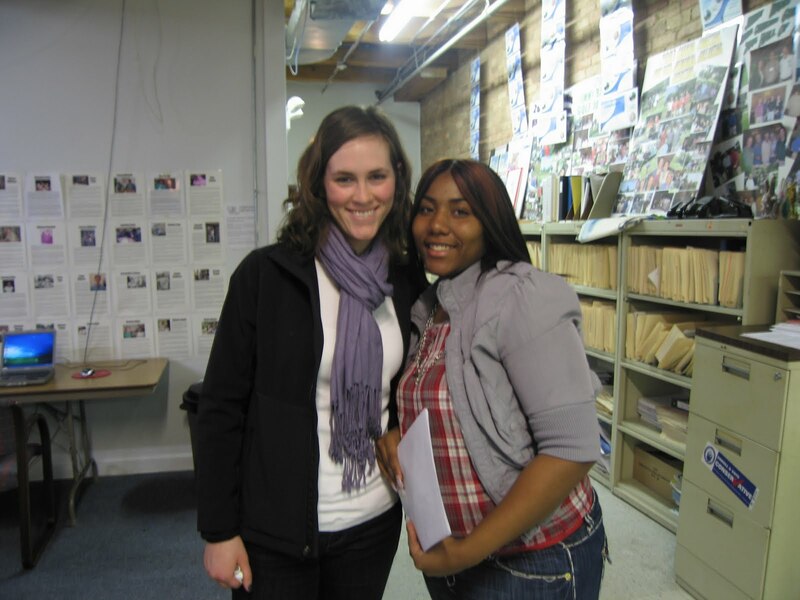 Together, we led a program that won awards from the Department of Family & Support Services Youth Division in 2009 and 2010 for being the best mentoring program funded by the City of Chicago and we had five seniors graduate this year who are all headed to college in the fall. Not too bad, eh? Thank you all for keeping track of the program on my blog (I had 5228 absolute unique visitors!) and thank you for reading all of my stories (This is my 217th blog post!). I hope they made you smile, and laugh, and think, and reflect. 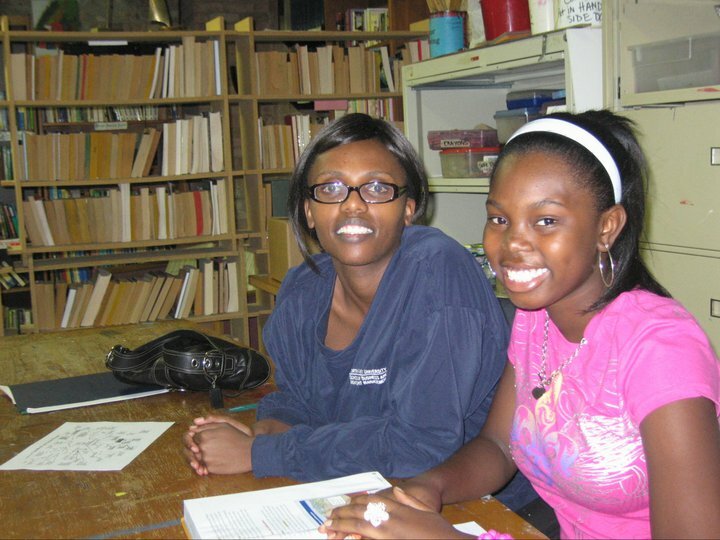 Major cities like Chicago will always have thousands of youth in need of educational and financial assistance. 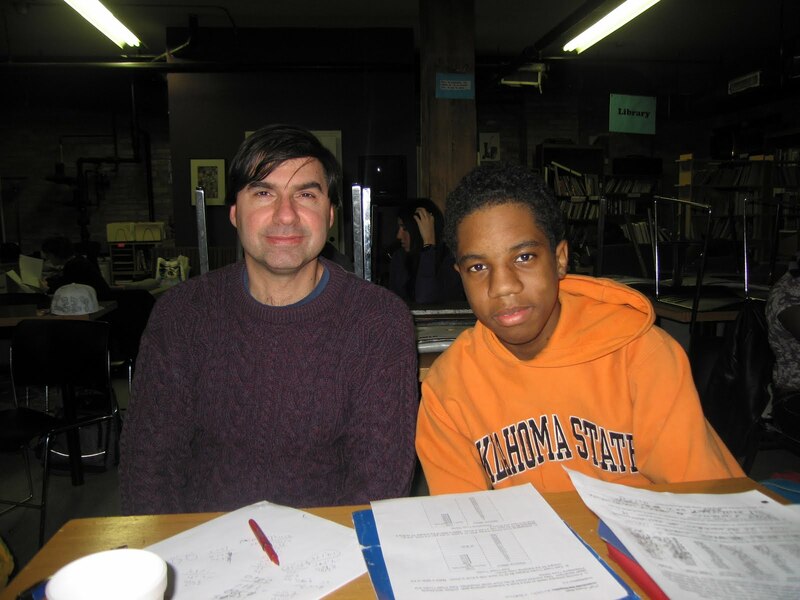 A tutoring and mentoring program like Cabrini Connections can change a young person's life. I've seen it happen. Please continue to support nonprofits like this one with your time and dollars. We are all a part of the solution. One love. 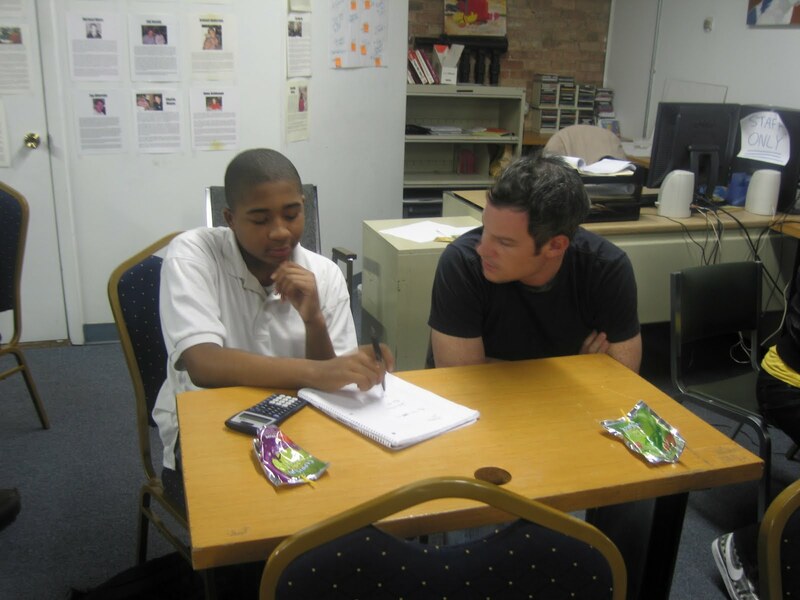 Each year during Chicago Public Schools' Spring Break, Cabrini Connections organizes "Career Week" - a week full of trips to visit mentors in their workplaces. This year Jerman Beathea, Marcus Burks, Justin Fields, Dionte Herron, and Ana Tate visited a hospital, a grocery store, a scientific and educational association, and a university. Javon Gordon is a 7th grader at Manierre Elementary School. He lived in the Cabrini Green area until a couple years ago when his family moved to the west side. 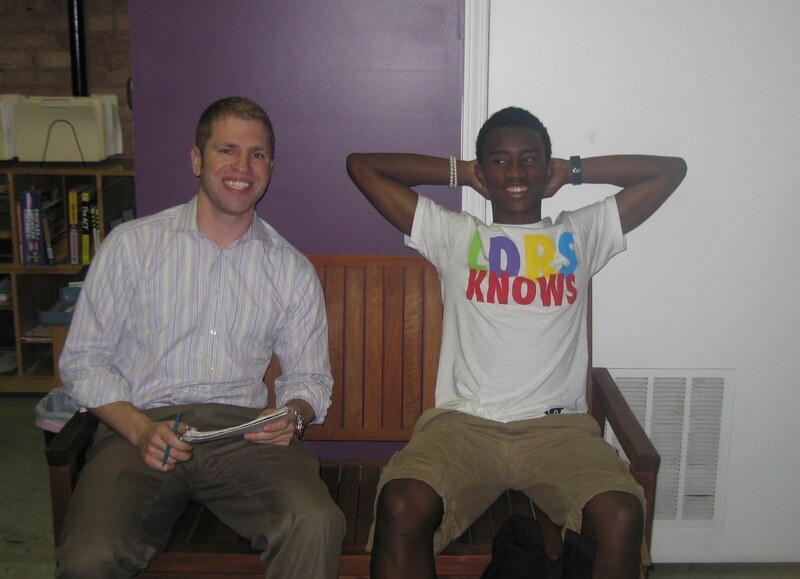 He says the move was tough because he left a lot of his friends, but participating in Cabrini Connections gives him the opportunity to come back. Javon’s older brother, William Gallion, who is an 11th grader at Lincoln Park High School, has been a member of the program since 2007. Project Cabrini Green’s live feed video component, coming from the demolition site, can be watched here 24/7, for the duration of the demolition. The light installation is visible every day, from 7pm to 1am CDT. 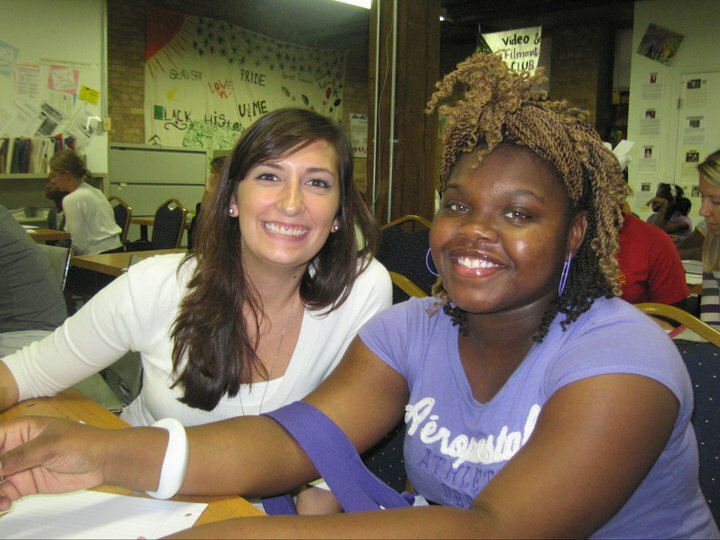 Click on the image above to be taken to the Project Cabrini Green web site. Once you are there, click the Home tab to find students' actual audio and text which become the lights. Below are two videos about the project. "Cabrini's Got Talent" for real! Thank you to all of the performers and audience members who came out to the first ever Cabrini Connections Talent Show presented by the Youth Leadership Council on Saturday. All six members of the council worked the entire quarter to make their dream of this show a reality and it paid off... literally! $115.50 was raised from 32 attendees and will go towards the Council's next event (TBA). After all of the performances were done, we had everyone vote on their top three and we said that the "winners" would be invited to perform at the Year-End Dinner. No one knew this beforehand or during the show because we didn't want it to feel like a competition. 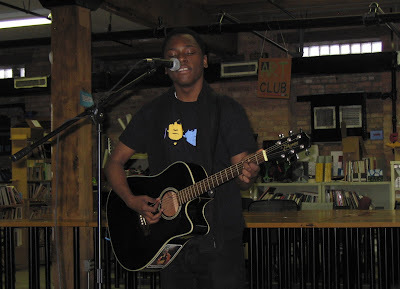 We would also like to invite Gabe Chapman (guitar) who was the highest vote-getter among the volunteers who performed. You can see all five of these performers live at the Year-End Dinner on Thursday, June 9th, at Cornerstone (1111 N Wells St). Hip hop artist GLC from Chicago visited Cabrini Connections on March 2nd, 2011 to speak about "love, life, and loyalty" - from growing up on the south side of Chicago to becoming a successful artist, working with legends, and winning two Grammies. We all suffer losses and we take losses in our life, but from those losses we should just use those as motivation in order to win and become a winner and become successful, because if I did it, you definitely can. Church! I'm quoted in the Chicago Tribune! 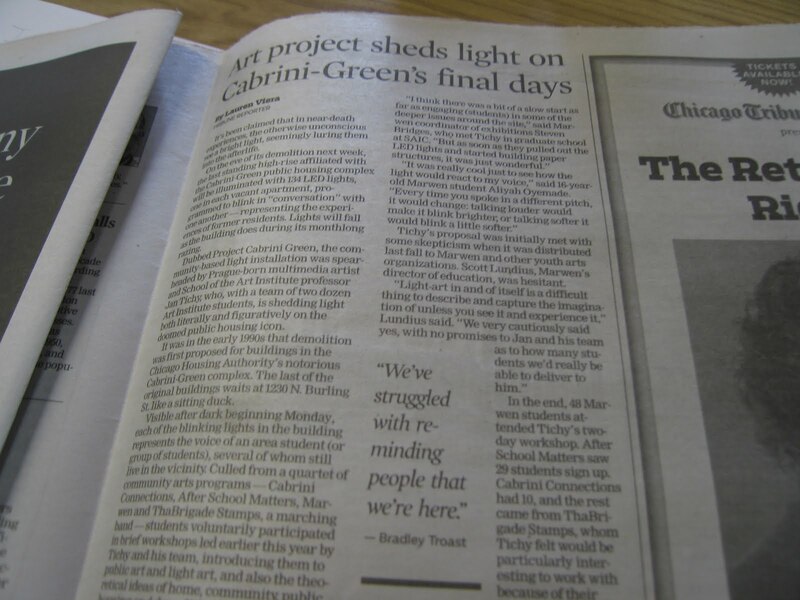 It is about Project Cabrini Green which will light up the last high-rise building of Cabrini-Green beginning next week. In January, Cabrini Connections students took part in a public light art workshop with the School of the Art Institute of Chicago. They created stories and poems which, based on the rhythms of their recordings, were turned into blinking LED lights. Their lights will be among those placed in each of the 134 windows of the building. First year student Elisabet Ortiz was born in St. Anthony Hospital in Chicago on Mexican Independence Day (September 16th). 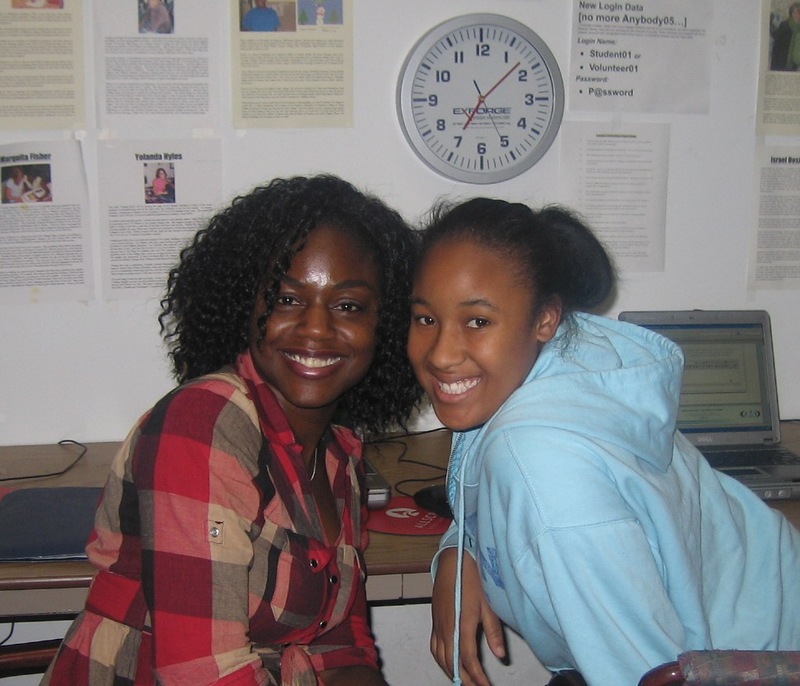 She attends Lincoln Park High School where she is in the double honors program. Her favorite subject right now is chemistry but she understands the math component and she enjoys doing experiments. “I love playing with fire,” she says, literally. 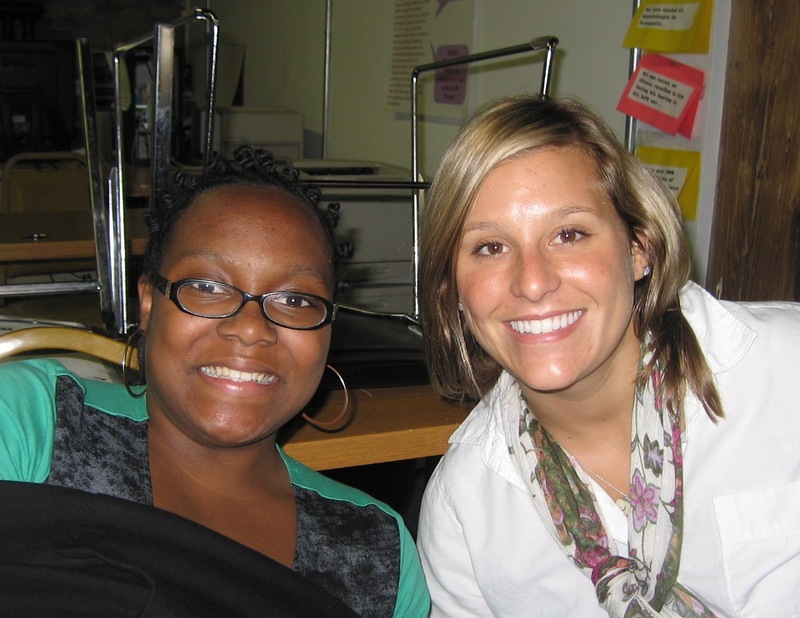 Elisabet says school is important because, “I need to go to school to be what I want to be. I’d die if I didn’t go to school. You have to work for your long-term goals,” and she does just that! 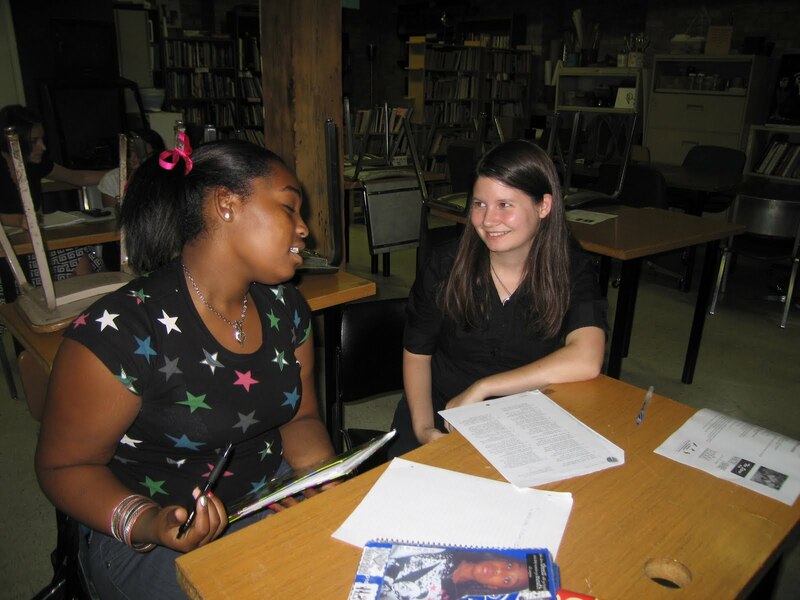 Elisabet’s goal is to graduate high school with a 4.5 GPA. She plans to join the military (noncombat) after school, come back and go to Harvard, get a Ph.D. in Law, become governor, and become the first female president of the United States! 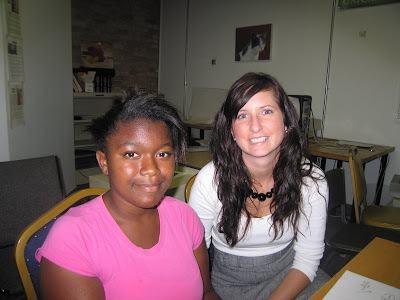 First year mentor Natalie Durda was born in Eden Prairie, Minnesota, a southwest suburb of Minneapolis. “Things move a little bit slower [in Minnesota],” she says. “Everyone is really nice,” and even though it is north of Chicago, the winters are not as bad because it is not as windy. In school she loved English, Spanish, and social studies, and, “Soccer was my sport.” Natalie’s parents instilled a strong work ethic in her, so she has always worked hard. She was already working 20 hours a week in high school! For the second year in a row, Cabrini Connections is hosting a fundraising tournament called Cabrini Madness, and for the second year in a row, I am co-producing weekly videos to promote the campaign and its teams. Above, you can watch "Maybe" - the original Michael Jordan commercial and the EL Da' Sheon Nix remake. Below, you can watch "The Decision" - mimicking LeBron James' ESPN special - and "Training Days" - showing teams, including my Green Team, preparing for the 2011 Cabrini Madness season. Cabrini Connections' second annual Cabrini Madness fundraising tournament is officially underway. Last year, my team, The Green Team, advanced to the Final Four and finished in 3rd place with $1865 raised. This year I am excited to announce that The Green Team is back! Our goal is to break $2000 and contend for the title. In honor of Valentine's Day, I am matching donations up to $50 total for the next 24 hours, which means, for example, two $15 donations and a $20 donation will become $100, or one $50 donation will become $100. I would appreciate your contribution to get this campaign started. You can click on the screenshot above to access our fundraising page. Thank you very much! 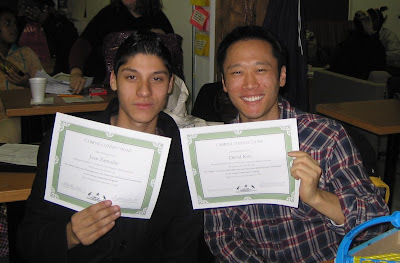 2010 Holiday Appeal a success! On December 1st, I began a letter writing campaign that would see $1495 raised for Cabrini Connections by mid-January. 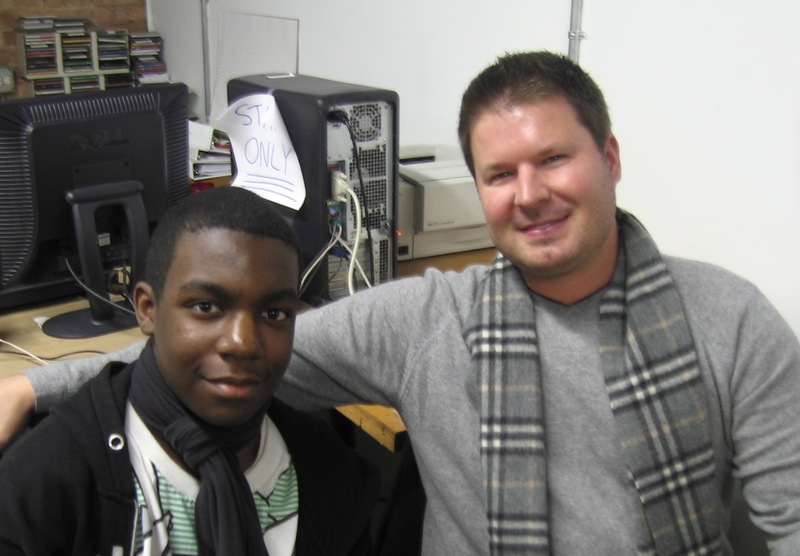 The day before, on November 30th, we met as staff to discuss plans for the 2010 Holiday Appeal. Each year we send letters out to our database of past donors and volunteers. An official letter was written up, but our president, Dan Bassill, encouraged us to add a personal touch. I decided to kick it up a notch. 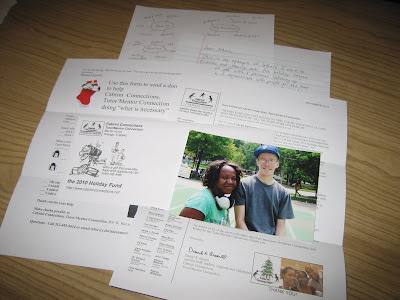 In the envelopes that I sent out in December and early January, I included a full-page, personalized, hand-written letter, at least one photo print, a link to my fundraising page, the standard Holiday Appeal letter, a donation form, and a return envelope. This was a great opportunity to catch up with family and friends, both on a personal and professional level. I really enjoyed the process. On December 16th, the Youth Leadership Council met for the last time in 2010 to decide on a group assignment for winter quarter. Each quarter, the Council is expected to complete one group assignment and each member is expected to complete one individual assignment. After debating several options, the decision came down to a lock-in or a talent show. The group decided to go with a talent show because, given our financial situation, they felt it would be helpful if their assignment had a fundraising element. The lock-in will most likely be saved for spring or summer as a celebration of the year.